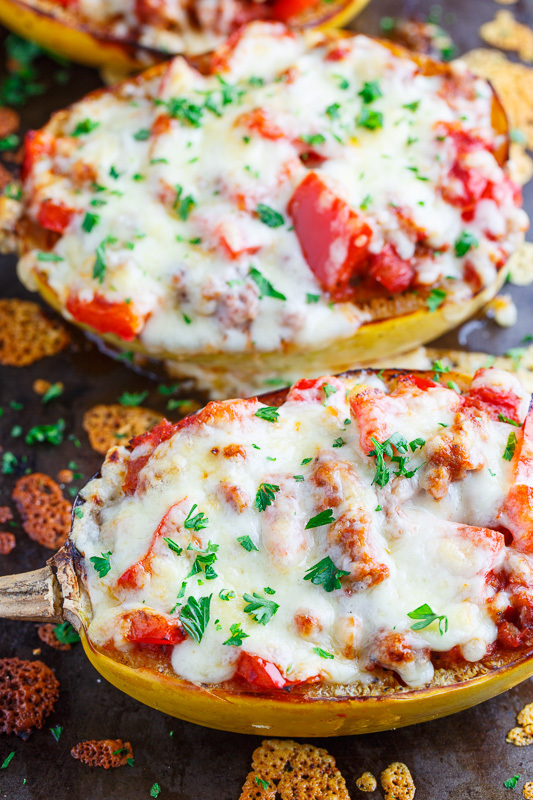 A quick, simple and tasty sausage and pepper stuffed spaghetti squash! It’s time for another fall recipe and this time I have an easy and tasty sausage and pepper stuffed spaghetti squash! 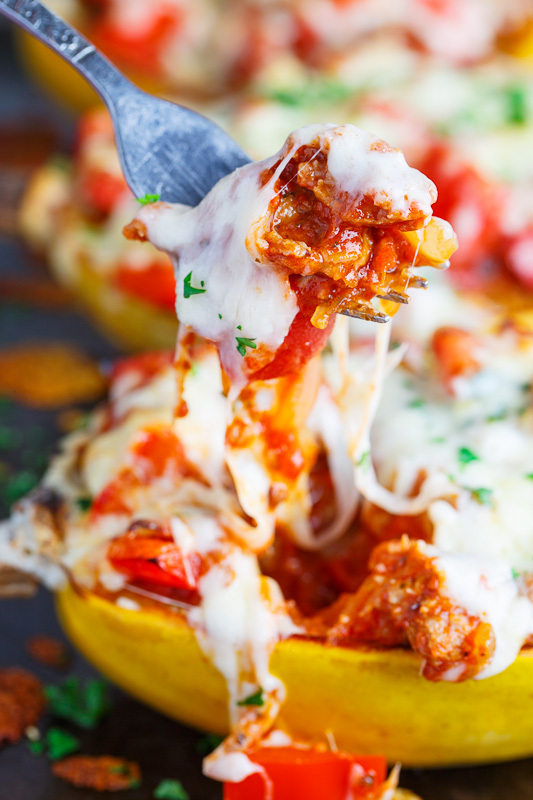 This recipe could not be easier, you simply roast some spaghetti squash stuff them with a mixture of Italian sausage and diced red peppers in a tomato sauce and cover it all in melted cheese! A lot of the flavour in this dish comes from the sausage so choose some that you like and you can either make your own marinara sauce or use your favourite tomato based sauce. 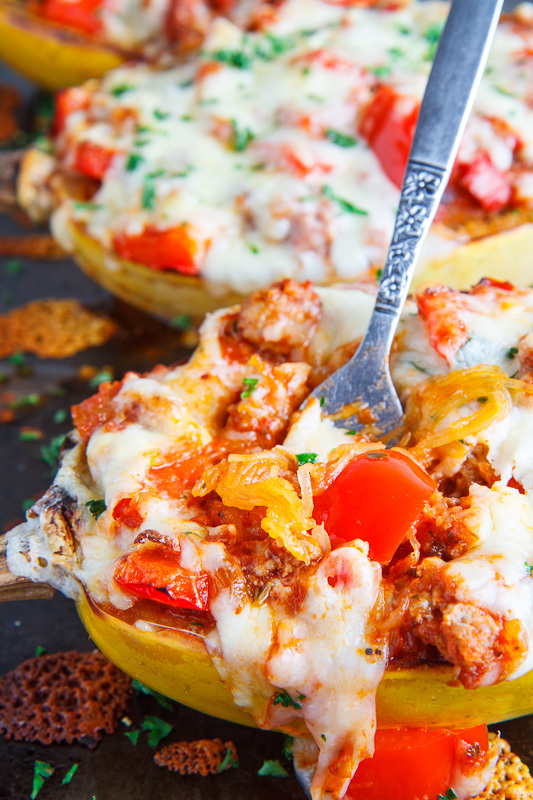 This recipe is a great way to enjoy some fall spaghetti squash and it a great way to cut down on the carbs since the spaghetti squash replaces the pasta! Just look at all of that ooey, gooey, stingy melted cheese! Brush the inner flesh of the spaghetti squash with oil, season with salt and pepper and roast, skin side up, in a preheated 400F/200C oven until tender, about 30 minutes. Meanwhile, cook the sausage, about 8-10 minutes, crumbling it as you go and set aside. Heat the oil in a large pan over medium heat, add the onion and cook until tender, about 5-7 minutes. Add the sausage and marinara sauce, cook to heat and remove from heat. Fluff up some of the inside of each spaghetti squash half, divide the sauce and the cheese between them and broil in the oven until the cheese has melted and turned a light golden brown, about 2-3 minutes. Option: Use your favourite tomato sauce. 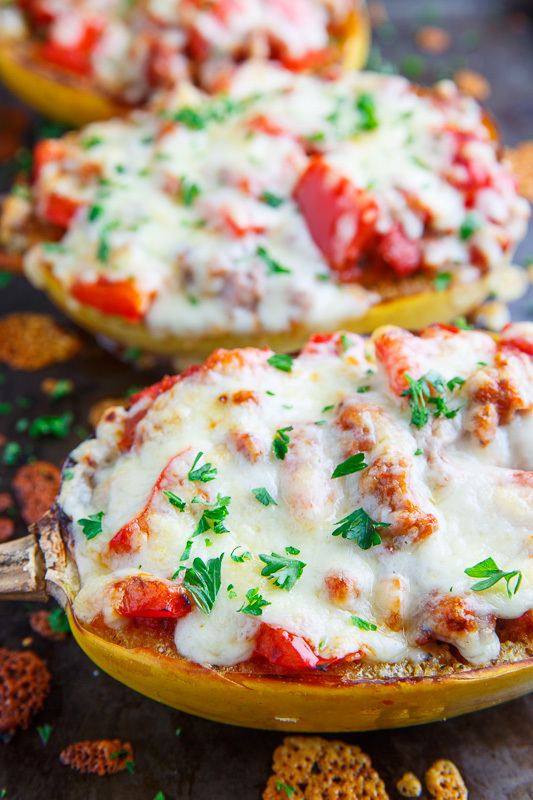 Spaghetti squash is such a yummy veggie! Your recipes are so great!!! I love them and the pictures look like I can put my hand in and grab a bite. YAS! 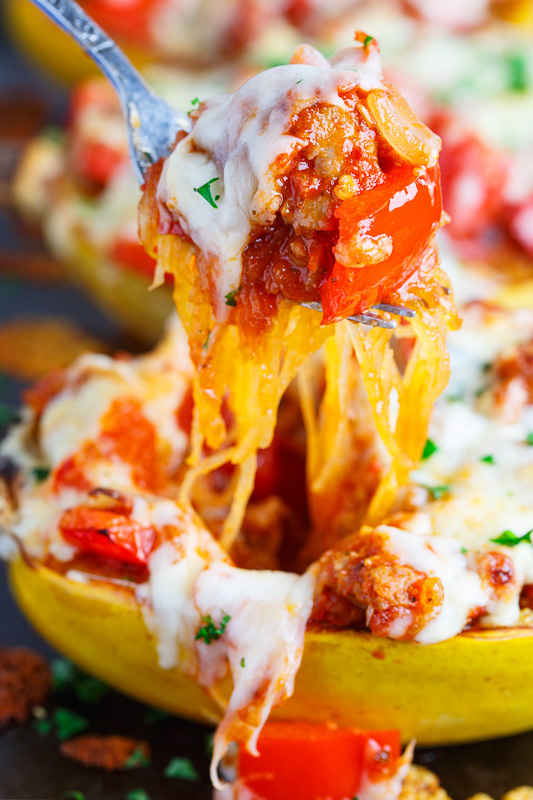 so ready for the fall revival of spaghetti squash! We made this for dinner last night and it was delicious. And filling! Both my husband and I really enjoyed it. Thank you! I made this last night and it was really tasty! Even my picky children ate it 🙂 Thanks. Will have to check out some of your other recipes. Maren Dalida: I'm glad everyone enjoyed it! I absolutely love this recipe, but, you might want to rethink the calorie count on this one. I used the exact measurements on this and when I did my calorie addition, it was somewhere between 625-700 calories depending on the sausage used. VERY disappointed when I found out I just added close to 300 extra calories to my daily total. m interested to see where you are getting the 700calories from!